The previous Euroconstruct conference was held a few days before the referendum in the UK, so the Barcelona conference has provided the first opportunity to assess the repercussions on the European construction sector. Maybe Brexit has not yet caused a direct disaster on the European economy, but it has indeed lowered the mid-term expectations, of course combined with a long list of other factors: China slowing down, Germany slowing down, uncertainty in the US, European banks still not out of trouble, interest rates likely to increase … Since construction is heavily influenced by the mid-term prospects, it is hardly surprising that the new forecast is less optimistic than the one published half a year ago. The new estimate for construction output in the ­Euroconstruct countries in 2016 is 2 %, six tenths of a point less than in the forecast last June. But the real problem is not that growth we were expecting and has not come about, but the fact that behind that European average that still looks healthy there are far too many exceptions: lack of growth in in civil engineering and lack of growth in six countries (Poland, Hungary, Czech Republic, Slovakia and by a narrow margin, also the United Kingdom), Figure 1. 2017 starts without very encouraging economic expectations (just 1.4 % GDP growth) but the construction sector has the potential to grow somewhat more (2.1%). There is an interesting window of opportunity created by a combination of cheap credit and a more favourable perception of building as an investment shelter. However, this opportunity may be ephemeral, and not a driver for the longer term. The key factor for strengthening the construction sector is public demand, which Euroconstruct expects to keep improving, but only marginally and in some countries. With such weak foundations, the growth expected for 2018 and 2019 is between 2.1 and 2.2 %. 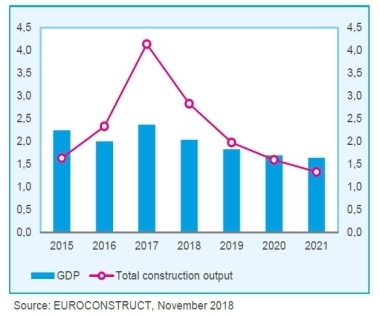 Nevertheless, if the forecast becomes a reality, the European construction sector will reach 2019 with uninterrupted growth for six years in a row. This would put the output level at only 3 % below the 1995–2015 average. The forecast for residential is the only one that has been revised upwards and includes a substantial improvement on the 2016 estimate (3.9 %). New housing construction in particular has assumed the role of maintaining the recovery pace of the whole European construction industry. Spain and Italy may still be producing way below their averages, but France, Germany and even the United Kingdom are returning to their comfort zone. Production is also improving in other smaller countries, frequently because the demand has come to life and has found little housing on offer because of the low output in recent years. Credit may not remain as favorable as it is today for much longer, so the trend for 2018–2019 is prudent, round 2 % (Figure 2). 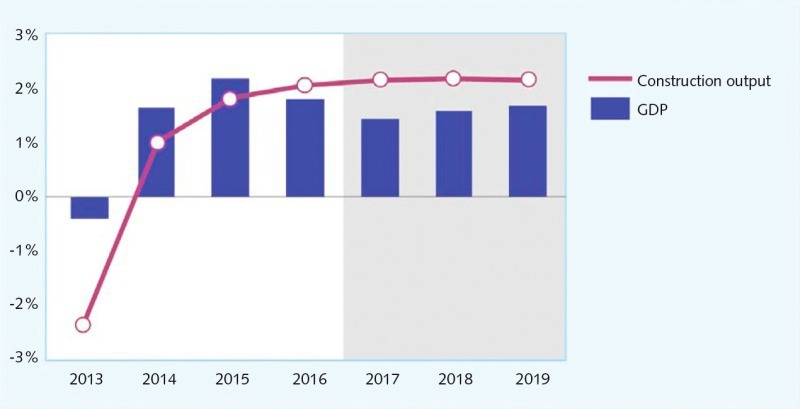 Non-residential construction is still at the very early stage of its recovery process, since its new building component has been decreasing up to 2016. Therefore, the present downgrade in the economic outlook comes at a very inconvenient time, cooling the already weak demand for industrial and tertiary assets. Euroconstruct does not expect quick changes, so growth for 2016–2017 will be around 1.5 %, and 1.8 % for 2018–2019. Office construction will perform somewhat above these averages, since it comes from a period of significant contraction. It is worrying to see that industrial and storage construction are expected to perform below the non-residential average, which is a sign of low expectations from demand (domestic, European, worldwide). The United Kingdom has suffered a downgrade in its non-residential segment, and the growth expectations forecast before the referendum are fading. Non-residential construction in Germany confirms its downward trend, in a context of caution in investments. The bad results in those two key markets can not be fully offset by the improvement in markets like the Netherlands, Belgium and Denmark. 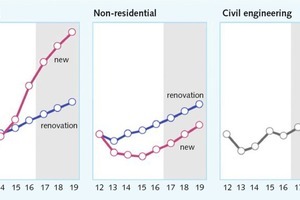 Civil engineering is the market segment where the forecast has worsened most, up to a point where the new estimate for 2016 is now negative (-1 %). The reasons for this downward pull differ among the countries that are most affected. The four Central-Eastern countries were already expecting problems in 2016 due to the period of transition between the end of the 2007–2014 and the start of the following round of EU structural funds. Then we have Portugal and Spain, two countries with problems of fiscal imbalances that are weighing down infrastructure investment. Finally, the United Kingdom faces another shift in expectations and its civil engineering has entered a hiatus of low activity that may last up to three years, depending on the hypothetical start of a specific programme of infrastructure development as an anti-recession measure. However, as soon as structural funds flow back into the Eastern countries, European civil engineering will be in position to grow again in 2017 (1.8 %). 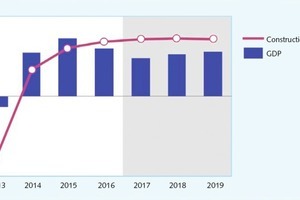 The positive trend will continue in 2018 (2.9 %) and 2019 (3.2 %). 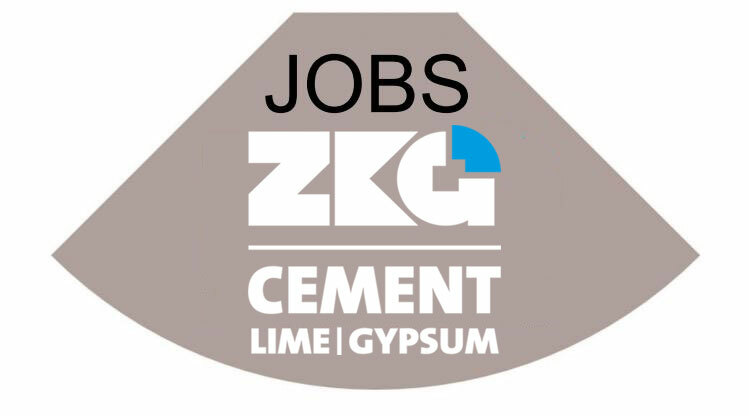 The increase in construction output in 2016 will come mostly from Germany. But the German pull on European construction will begin to fade: it will drop to the second position in 2017, and in 2018 Germany will disappear from the list of top contributing countries. This will leave France as the main generator of extra output throughout the whole forecast period. Italy is a reliable contributor too, holding either the 3rd or the 4th position each year; and the Netherlands also, that fluctuates between 3rd and 5th. The absence of the UK among the top contributing countries during 2016 and 2017 will be noticed, but it re-enters the list in 2018 and becomes the 2nd contributor in 2019, with almost the same output as France. The small size of the Irish market is no obstacle to finding Ireland among the top 10 in each year except in 2018, when it barely misses it because it drops down to 11th position. The next Summer’17 Conference will be held in Amsterdam, from 08.06.-09.06.2017, and it will be hosted and organised by EIB, the Dutch member of Euroconstruct.